RicoRock® castings are made of a dense concrete mix with fiber reinforcement; there is very little porosity so it will weather better than most concrete mixes. All concrete and even natural rock will age and show discoloration or flaking. Some common problems are addressed here but RicoRock® should last decades with minimal maintenance. Adding just a few accents and antique can liven up rock that has been bleached by the sun or chemicals but it is easy to over-do it. Strong colors will fade more than softer tones. Stain colors are stronger when the surface dries out. Removing colors with chemicals is messy and covering with a base coat of paint will only lead to more issues in future years. In extreme cases the paint colors will need to be removed with a sand blast type treatment using soda, corn cobbs or beads; this is used on pool plasters and other concrete surfaces where water blasting is not adequate. Mortar joints sometimes fail to keep a perfect bond and most waterproofing will not permanently bridge the tiny gap that allows seepage. Our new Flexible Bond Coat will bridge small gaps and can be colored as a finish coat. Click here to view our video tutorial. After many years all concrete surfaces tend to crack because of stress and thermal changes but repairs have been done successfully on projects 10 years old or more. Click here to view our video tutorial. 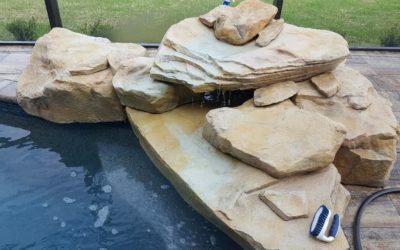 RicoRock waterfall kits are designed for a level surface or a pad sloping towards the pool. If the pad slopes away from the pool the standing water may be higher than the watercourse area. If the waterfall is set away from the pool edge it can easily seep under the waterfall. Some waterfalls are designed for a low flow rate and a high flow will allow water to escape the intended water course. 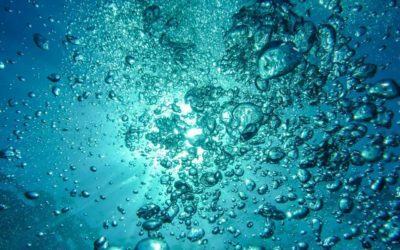 Especially with fiberglass pools the acidic build up in the water causes damage to any concrete surface, including RicoRock. When the top film of cement is dissolved the color is gone and the substrate is exposed. Flexible Bond Coat can be used to repair this damage in most cases after the surface has been neutralized with a soda ash wash and thoroughly cleaned. This is caused by a weak bond between the mortar and rocks; even a small amount of water pushing thru the joint will leave white calcium deposits. 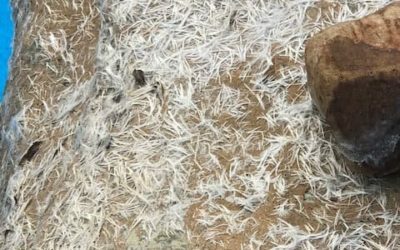 If the mortar joint has totally failed the rocks may need to be re-set but usually they can be repaired with the Flexible Bond Coat and re-colored. It may take some weeks for the internal moisture to dissipate so the repair may not appear to work immediately. This indicates water is moving thru the structure, maybe by capillary action. The water must be stopped where it enters, sealing the bottom just dams up the moisture. Improperly sealed pipes in water basins or light conduits are often the cause just like with pool structures.